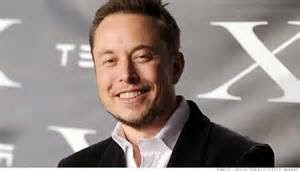 Musk is CEO and Chief Designer of SpaceX, the company he founded in 2002 to build the world’s most advanced rockets and spacecraft with the ultimate goal of extending human life to other planets. He designed Falcon 1, the first privately developed liquid fuel rocket to reach Earth orbit, as well as the Falcon 9 rocket and Dragon spacecraft. SpaceX made history when its Dragon spacecraft became the first commercial vehicle in history to successfully attach to the International Space Station on May 25th, 2012. In 2008, NASA awarded SpaceX a $1.6 billion contract for 12 cargo flights to and from the International Space Station, effectively replacing the Space Shuttle. In 2010, SpaceX became the first commercial company to successfully recover a spacecraft from Earth orbit; a feat previously only achieved by a few nations. In 2011, the company started work preparing the spacecraft to carry astronauts under a NASA award. The first manned flights are expected in 2015. Tesla CEO Elon Musk said there "definitely" won't be a recall of the Model S, quashing rumors in the wake of three battery fires during the past five weeks that have put some pressure on Tesla's lofty stock price. "There's no reason for a recall," the outspoken CEO said in defense of the electric cars during a conference Tuesday hosted by The New York Times Dealbook blog. "If you read the headlines, it sounds like Teslas have a greater propensity to catch fires than other cars. In reality, nothing could be further from the truth." Musk noted that the Tesla Model S is five times less likely to catch fire than average gasoline cars. "We have never had a serious injury or death in any of our cars. Maybe there is a car as safe as the Model S, but there is certainly not a car that is safer," Musk said. Related: Does Elon Musk want to challenge Boeing? Musk said that in the case of the three fires, the owners of the cars have asked for Model S replacements as soon as possible. Shares of Tesla (TSLA) have tumbled nearly 30% since the first fire was reported in early October. They were higher in after-hours trading Tuesday. Despite the recent retreat, shares of Tesla remain up more than 300% so far this year. Last month, Musk said Tesla was trading at a price that was higher than the company had "any right to deserve." On Tuesday, Musk said a high price is "distracting," but added that the current value is a better deal. Elon Musk, he of Tesla and SpaceX fame, is looking to shake up the transportation industry with an idea called the Hyperloop. Businessweek has some details concerning how the Hyperloop would work, and Musk himself has released a 57-page PDF alongside an accompanying blog post, but here are the basics. In Musk’s vision, the Hyperloop would transport people via aluminum pods enclosed inside of steel tubes. He describes the design as looking like a shotgun with the tubes running side by side for most of the journey and closing the loop at either end. These tubes would be mounted on columns 50 to 100 yards [46 to 91 m] apart, and the pods inside would travel up to 800 miles per hour. Some of this Musk has hinted at before; he now adds that pods could ferry cars as well as people. ‘You just drive on, and the pod departs,’ Musk told Bloomberg Businessweek in his first interview about the Hyperloop. Musk’s PDF states that capsules would each carry up to 28 passengers at a time, departing “on average every two minutes” or “up to every 30 seconds during peak-usage hours.” The alternative system that could carry cars would fit three “full-size automobiles” inside each capsule. So how would the Hyperloop actually work? Musk goes into great detail about it in the 57-page PDF, if you’re looking for the most technical explanation. But According to Businessweek’s piece, the pods would be mounted atop thin skis and would move along inside the steel tubes while under low pressure, propelled forward by magnets and an initial electromagnetic pulse. The skis would have holes in them, through which air would be pumped, creating a levitation effect.